The session worked as always with three questions on the theme of the conference. In this case, the questions we chose were as follows: 1) What does it mean to be empowered and why is it important? 2) There are many challenges the dispossessed and excluded face. What are the causes of these obstacles? 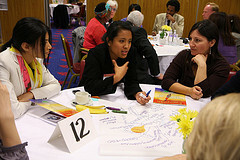 3) How can I/We contribute to the empowerment of the dispossessed and excluded?The questions were purposely structured in this way so as to encourage a personal conceptualisation of the themes of the conference, then to go on to provide reasons as to why we see the failure of the upholding of such values within society. Although the second question appears somewhat negative, it provided a good level of positive leverage with which the third question could provide a chance for proactive thought as to how such problems can be overcome. This was also a good means by which those involved could find a sense of empowerment and self-reflection on their own actions in contributing to societal change. Due to the importance of the sense of intimacy the session can create, as usual, participants would briefly introduce themselves to one another at the new tables they go to. Although there were several inferences that the introductions consumed too much time, we decided to keep them so as to maintain a more personal experience for participants. Moreover, as it still allowed for approximately ten minutes of discussion time, it would be appropriate to maintain this aspect of the sessions in future. Above anything, it provided a chance for participants to find connections amongst other participants in the conference who in the future could become potential partners in conjunction with UPF goals. Overall, the atmosphere which was created by the session on the whole was as was intended. It fostered positive debate of a friendly nature. Such dialogue is absolutely crucial for the development of strong relationships with ambassadors for peace and UPF members. The sessions were also greatly aided by the support of our enthusiastic moderators who did a fantastic job. In future, more time should be given to them to become familiar with their role. Having two MCs to host the session seemed to go down quite well, although to build on the point on experience, with more time, the hosting will become more clinical. The concluding question session was also a good way to encourage deeper thought amongst participants with their opportunity to write a summary point of the discussions. The session flowed well, considering the limited preparation time that was given for the session. However, with more practice the world café will develop into an even greater means to encourage an atmosphere of positive discussion and internalisation of content, as well as acting as a platform for networking amongst ELC participants.